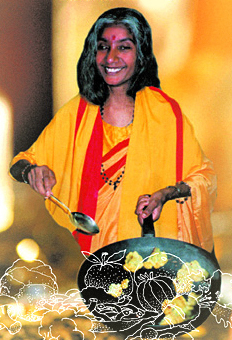 Shree Maa loves to cook and She believes that food plays an important role in purifying our hearts and bodies. Pure food gives rise to pure thoughts. While preparing the food, Shree Maa instructs we should contemplate God and recite mantras. This will purify the food and make it delicious! This is a recipe given by Lord Vishnu himself in the Satya Narayana Vrat, the story of the vow to speak and act in truth. Shree Maa prepares this sweet porridge every full moon to offer along with the story’s recitation. Labra is the perfect festival dish. It’s five vegetables bring a variety of flavor, color, and texture, while spices add exotic aromas and taste to this healthy dish. When prepared and offered with purity and devotion, it nourishes the body, mind, and soul! Urad dal is one of Shiva’s favorite dishes. This particular recipe from Shree Maa is very nutritious and flavorful – with hints of cinnamon, anise, and cumin. A wonderful offering for Lord Shiva! This a simple preparation of soaked mung beans, bananas, and coconut. Make it as a devotional offering to enhance your relationship with the Divine Soul within. Havishana is a simple dish that is healthful, filling, and very sattvic. It is easy to make, and its pure energy makes it a wonderful offering for Mother Saraswati. This is a simple recipe for poha (flat rice) with potatoes. It is a sattvic dish that is very nourishing and soothing to the system – especially when prepared with mantra, love, and devotion. Kheer is one of the most popular prasad items in the Devi Mandir refrigerator! Devotees prepare kheer every week for Santoshi Maa puja, and Shree Maa offers this sweet rice pudding to Lord Shiva every day. Fried eggplant is one of Sri Ramakrishna – and Shree Maa’s – favorite vegetables. Maa often makes this easy and delectable dish at festival times, such as Kali Puja, Ramakrishna’s birthday, and the Navaratri Annapurna Puja. Kitchari is an Indian Ayurvedic dish traditionally prepared with mung beans, rice, vegetables, ghee and spices. Use this recipe from Shree Maa to prepare a delightful kitchari – good for every meal of the day! Maa’s fig-mint chutney is so delicious, you’ll want to have a spoonful for dessert! This simple chutney is sweet and flavorful and offers a nice accent to Indian meals. Halva is a popular Indian dessert. This semolina halva recipe is sweet, simple, and delicious. At Devi Mandir, halva is offered to Divine Mother every Sunday following the Chandi Path. Modaks are a type of sweet beloved to Lord Ganesha. They can be made in various ways, but this particular recipe is one that Shree Maa created herself. Jai Maa! Jai Ganesha! This is another recipe for Ganesha’s favorite sweet! Make these as an offering for Ganesha on Chaturthi, or any other day that you choose to worship the Divine Lord of Wisdom!